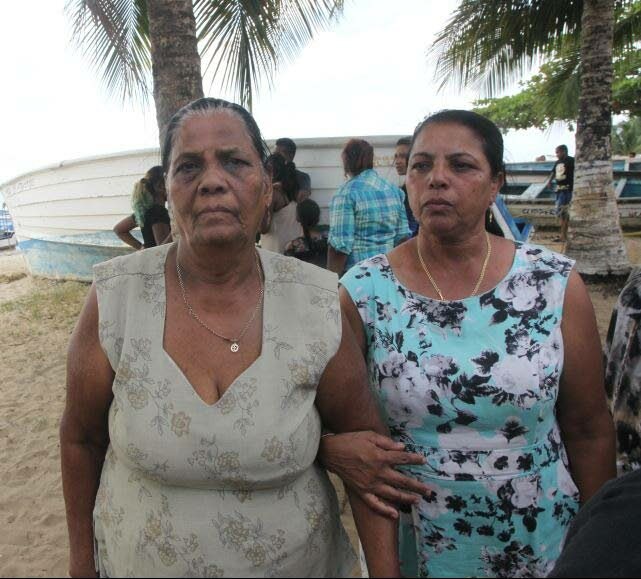 SURROUNDED by relatives in Carli Bay, Couva, where the body of one of her sons washed ashore after a boat capsized and sank, 74-year-old Etwaria Gyandass yesterday begged the sea to send back her other son. The bodies of her son Chunilal, 53, and his friend, Ronald Narinesingh, washed ashore yesterday morning, less than 24 hours after villagers and coast guard officers launched a search. They were among six Freeport villagers who went fishing off Carli Bay in the Gulf of Paria on Sunday afternoon when tragedy struck. Two men— Kumar Lalla, 49, and Glen "Dave" Prahalad, 32— escaped the wrath of the sea and swam ashore on Sunday night. But up to yesterday, Gyandass’ other son Siewnarine, 51, and Vinesh Marlo remained missing and relatives are fearing the worst. They are from Beaucarro Road. 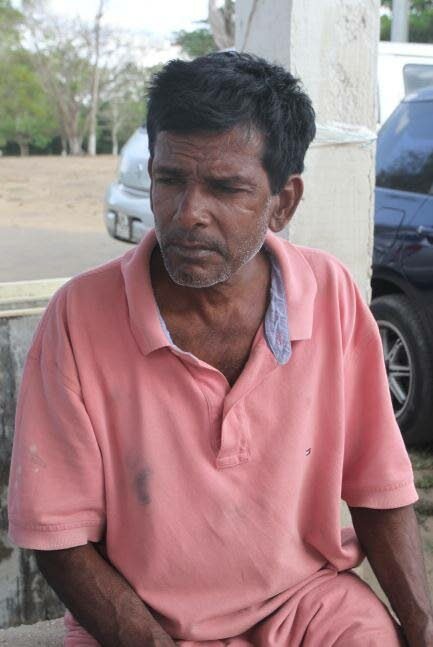 Kumar Lalla, 49, one of two survivors in Sunday's incident at sea where a boat capsized. With tears in her eyes, the mother of eight told Newsday, "We are begging the sea to send them back home. Both of them inside there and I am begging the sea to send them back out from wherever they are." Consoled by relatives as she offered flowers to the sea, Gyandass pleaded with the Hindu goddess Ganga saying Chunilal knew how to swim but Siewnarine "cannot swim too good." Siewnarine works as a truck driver. He is not married or has any children. "My daughter and they are still in the sea right now looking for the balance. Chunilal left home at about 1 o’clock with the others, and about 3 pm it happened. They were accustomed to coming and liming here. I heard they fixed a boat and went out to try it. Since the boat capsized, we are out here." She is the mother of three men and five women. Chunilal, also called Bubboy, was the father of two and grandfather of two. He worked as a doubles vendor and operated Kyle’s Hot on the Spot doubles at Chaguanas. Police said the men went fishing, as a sporting activity, but strong currents at sea caused the flat-bottom boat to capsize and sink. The men jumped out and were separated in the waters. Coast guard and air guard were called in. Relating the ordeal on the survivors, Lalla said the tide became high and caused the boat to rock and it began giving problems to start. "When the boat eventually started, the front of it raised up and the back went down. The back started to fill up with water and six of us jumped out the boat. We were drifting and they were bawling as the current was pulling them back out. I drift and drift," Lalla said. Lalla told Newsday he stood still in the tide for almost an hour waiting for it to go down to waist-height. "I reach back at about 8 pm. Dave came back first and tell everybody about what happened. He got a fishing boat and went back to save them, but he could not find them. Siewnarine was really tired and earlier suffering from chest pains." Pointing at the sea, Lalla said: "I saw death out there. I remain here whole night, I cannot leave them, they are family too. The paramedics checked me out from here." Marlo’s grandfather Rajkumar Heeralal said he too is hoping to get some news on the disappearance of the duo. Councillor for the area, Allan "Taxi" Seepersad, said he got a call about the incident from the MP on Sunday night. Ronald worked in the public health department of the Couva/Tabaquite/Talparo Regional Health Authority. He did a lot of agricultural work and played Santa Claus. "He was the Santa for my annual children’s Christmas treat. Last night when I came down, I met Ronald’s mother who lives Perseverance. She held me and she started to cry. She is ill and had an appointment today at Mt Hope to do some tests," Seepersad said. The councillor blasted the authorities saying the rescue response was inefficient. "I only saw the police when I came. It is sad to know that it is six families in stress here, and the authorities were not around." Up to last evening, the search continued. Reply to "2 drown, 2 rescued, 2 missing"